According to “Law Enforcement Officers Killed and Assaulted” from 2002-2011 (Table #36) research compiled by the FBI, 40% for all US Law Enforcement shootings occur under five feet and 76% occur under 10 feet. At those distances, any shooting is going to happen fast, so quick access to a personal defense firearm is crucial to your survival. This is why it is so important to obtain the right personal defense carry holster. Using the following secret tips will greatly assist you in your efforts in obtaining the right concealed carry holster. Always use a holster designed for and properly fits your handgun. Don’t try to save a few dollars by putting your new gun into your old holster or buy one of those one holster fits all rigs, since it’s not make for your new gun it may hinder quick access to safeties or the grip. Statistics prove, a gunfight is going to happen very quickly and any delays could cost you your life, so do not step over a dollar to pick up a dime. A holster must keep it stationary, so it right where you need it, when you need it. You don’t need your holster flopping around, when your trying to grab it. It needs to stay in the same location, so you can always grab the grip of the firearm without feeling around to find it or looking down for it. This will also keep the holster from moving upward with the firearm as you are trying to draw it. When you need it, your firearm must quickly separate from your holster. If you are forced to pull your firearm up an extra 6 inches, before it separates from your holster, you are wasting valuable time, and any delay in getting accurate multiple hits on your attacker could cost you your life. A stationary holster will allow you to draw the firearm with one hand. This is vital to maximize firearm safety, because it will prevent you from lasering your support hand with the barrel of your own handgun. A stationary holster can be critical if struggling with your attacker or your support hand is injured, and you are forced to draw the firearm one handed. This will prevent you from accidentally pressing your trigger and discharging a round, and if you happen to be involved in a struggle with an attacker who is trying to take your firearm, it can prevent him/her from accidentally or deliberately pressing the trigger to discharge the firearm. Let’s face it; if you are wearing a holstered firearm when it goes off, you are going to get the worst end of that exchange. A holster should allow you to obtain a secure grip on the handgun while it is still in the holster. Must gunfights occur up-close, so they happen very quickly. When you draw that firearm, you are not going to have any time to waste trying to readjust your grip, before you can accurate fire your handgun. A holster should have a gun retention device to keep the firearm securely in the holster during normal carry as well as greater physical activity caused by running, wrestling with an attacker who is trying to disarm you or being knocked to the ground. A retention device will assist you in keeping your handgun in your holster, if your attacker is stronger than you are or he/she has more leverage pulling on your firearm. This assistance (along with a simple and practical gun retention technique) may be all that prevents your attacker from disarming you. The last thing you want to happen is to run or be knocked to the ground, and your firearm flies out of your holster and slides away from your ability to use it. However, the use of multiple retention devices on a holster only serve to complicate and dramatically extend the drawing time of the handgun, and this is the last thing you want to do in a life and death situation occurring under 10 feet away. Remember, you must quickly remove your handgun from the holster and then use it to get quick accurate multiple shots on target, but it all starts with quick removal of the handgun from the holster. If you cannot do that, your odds of winning a gunfight are dramatically reduced. Finally, you need a high-rise, vertical design holster. 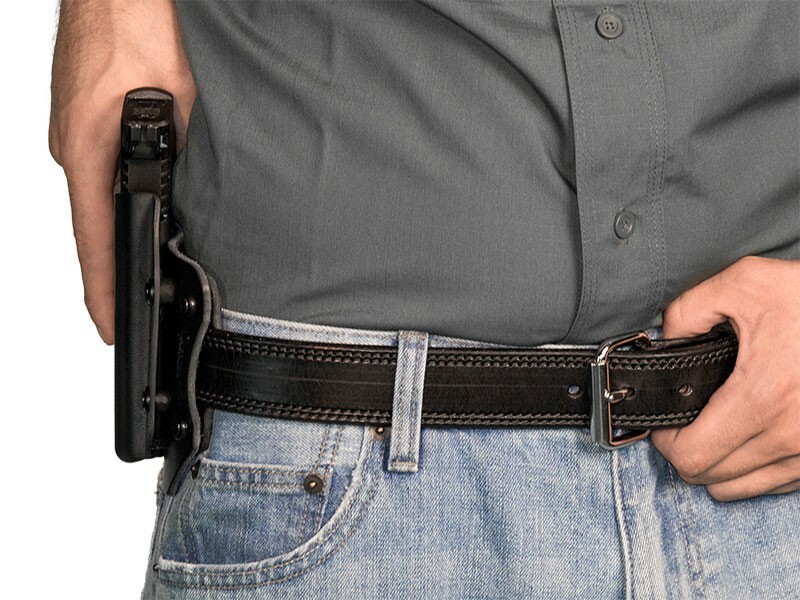 The high-rise design holds your personal defense firearm higher above your belt line, so it is much more concealable with just a short wasted jacket, shirt, or sweater. The high-rise, straight up and down vertical design also makes it much faster and easier to draw your firearm and bring it up on target, while you are standing and especially when seated behind the desk in your office, at a restaurant table or behind the steering wheel of your vehicle. Most holsters are designed with a fifteen-degree forward cant that has come to be known as “the FBI Cant.” This forward cant made it easier for the FBI agents to conceal their firearm, so they retained it over the years. Now, just about every concealed holster design has automatically adopted the forward cant concept. Most canted outside or inside the pants concealed carry holsters make it almost impossible to quickly draw the firearm while seated, because when your body bends to sit, these holders push the grip of handgun down and to the rear. This is even a greater problem, if you’re right handed and seated behind the steering wheel of your vehicle, because the seat belt and the seat belt latch mechanism will be directly in front of your holstered handgun. This will prevent you from drawing your handgun. Think about just how much time you spend seated at work, in a restaurant and in your vehicle. If you’re caught in one of these locations and are forced to use deadly force, your poor holster selection could cause you or your loved ones their life. Since 76% of all firearms attacks on US law enforcement personnel occur under ten feet, your quick access to a firearm will be crucial to surviving a life threatening attack. These six secrets to choosing a personal defense holster will help you choose the right holster for your individual personal defense needs.